If you are in the market for a hedge trimmer, then the first part of this blog will help you ask the basic questions about what you need, and what features to look for. From the right bar length for your needs, to the safety features to look for, there are a several things to think about. Once you have done that, the next big question is how your trimmer is going to be powered. So this week we are going to look at the options, and why you might choose one over the other. There are three ways to power hedge trimmers – by hand, by gasoline, or by electricity. We will save some comments on hand trimming for the end, so let’s look at gasoline first. Gas trimmers give you complete flexibility. You can use them anywhere, without being tied to a cord, and they just need a quick re-fueling to go as long as you need. But they are usually heavier, and noisier, so they are more the choice for someone with larger hedges, thicker wood to cut, and for someone with more experience with garden machinery. If this is your first trimmer, then gas might not be the right choice. As many people will know, small gasoline engines come as 2-stroke or 4-stroke. Traditionally, trimmers operate from a 2-stroke engine, which runs on a mixture of oil and gas. 2-stroke engines are lighter in weight, with fewer parts, and they can be operated easily in any position. 4-stroke were always for larger machines, such as mowers, but in recent years some of the top-branded hedge trimmers are coming with new, flexible 4-stroke engines, that work in any position, and are relatively light. These are mostly for commercial gardeners, but if you have some large hedges you might want to consider one. You need to be strong, and willing to pay several hundred dollars, but the result is a tough machine that can handle just about anything. For the rest of us, and normal garden use, a 2-stroke engine is a better bet, and a quality machine will be in the $200 to $400 range. It used to be that electric meant a long power cord, but today there are cordless electric trimmers. Let’s think about those that use a cord first. If you have smaller hedges, closer to the house, and you don’t have a lot to trim, then a machine with a cord is probably your easiest choice. These machines are light-weight, since you aren’t carrying fuel around, and they are priced at the lower end of the market, so you won’t break the bank. Unless you already have an outdoor extension cord, you need to add the cost of that to the cost of the trimmer, so the price is more than it looks at first. As a rule, a cord is probably not a practical option if the furthest point you need to go is more than 100 feet away. Within that range you should be fine. Remember that outdoor cords are usually 100 ft long, and it is unsafe to join two together – moisture can enter the connection, and it might drop into a puddle. Also, long cords don’t always trip the safety switch, with potentially fatal results. So stay within that 100 feet range. Take a ball of string and measure it out as if you were working, from the closest power-point. Don’t just run a straight line with a tape. If you don’t have outdoor power-points you will have to run it from indoors, or perhaps from the garage, which will add distance too. The second issue with corded trimmers is handling them when working. There is a danger of trapping the cord in the blade while cutting, so you always need to be aware of where the cord is while you are working. The development of improved re-chargeable batteries has made cordless trimmer the latest thing, although few approach the power of a gas trimmer. You can reckon on a high-end gas trimmer cutting branches an inch thick, a similar corded trimmer will cut ¾ of an inch, but the best cordless will probably only be able to handle ½ an inch. If you trim regularly that should be more than enough. There are several advantages to using a cordless trimmer. They are lighter than a gas machine, although heavier than a machine with a cord. They are the quietest of all, which can be a big consideration for your family and neighbors. They don’t surround you with fumes, and they don’t pollute the environment with exhaust gases and carbon dioxide. You don’t have to go out for fuel, or carry it around with you, although you might want to have a second battery pack. Which is the main limitation to these machines – run time. Smaller machines may not run for enough time to finish the job, so consider how long it takes you to cut, and try to buy something that will last. The other thing to check for is the charging time. There have been a lot of innovations in this area, and charge times of just 30 minutes are increasingly common. So on a big job, you can recharge in the time it takes you to have a coffee break, or over lunch. This means that in practice you can go forever on just one battery. Batteries can become heavy, and to get the longest run-times without carrying a heavy trimmer, back-packs are available. Wearing the battery makes it a lot lighter, and once you enter this bracket of machine, you can consider a system with one power-pack and multiple appliances – blower, hedge-trimmer, string-trimmer and more. You get high quality with a lower overall investment. Some people consider hand-trimming something for grandad only, but others recognize that for the best finish, nothing beats it. If you have small sections of hedges, or specimen plants you like to keep trimmed, you will be amazed at the difference in the quality of the look from hand trimming. If you want to make complex shapes, then hand trimming is pretty much essential. Find a good pair of shears. The best are usually sold as ‘topiary shears’, and have shorter, slim blades. Learn how to sharpen them properly, and keep your shears sharp, and properly lubricated. This is the quietest option of all, and there is something satisfying and calming about hand trimming. If you have never tried it, give it a good – it’s the Zen of hedge trimming. Everyone loves to see an immaculate hedge, trimmed perfectly, with that perfect smooth, dense surface. Having the right trimmer for the job makes all the difference, and so does taking care of it properly. If you have an old trimmer, now is the right time to be out buying a new one, so that your hedge will look great and the job will go quickly. If you feel bewildered about which kind of trimmer to buy, read on, and things will soon be a lot clearer. In this part we will look at the basic parts and options of a trimmer, and safety features to look for. Next time we will look at the possible power sources for your trimmer. Most trimmer blades have teeth along both sides, but some have them on one side only. Single-sided blades are safer to use, because you are always cutting away from yourself. Double-sided blades are more usual and cutting in both directions is considered better for your hedge. If you are left-handed then a double-sided blade will be easier to use. How wide is the gap between the teeth? The space between the teeth varies, and it determines the widest branch you can cut cleanly. The branch has to fit between the teeth to be cut. Larger machines have more powerful engines, and can cut thicker branches, so the teeth are wider apart – an inch or more. If you are planning to cut an over-grown hedge, with thick branches, then you might need that, but for ordinary use a gap of 3/8 to ¾ of an inch will be fine. Remember that for most conifers (yew is an exception), if you cut into a thick branch with no green parts on it, it won’t regrow, so if you have an arborvitae hedge for example, like Thuja Green Giant, you don’t want to be cutting into thick branches anyway. Also, finer spacing gives a neater trim, so if you trim regularly, a narrow gap will give you the best results. Blade lengths vary a lot. A short blade is useful for smaller plants, but it will take longer to do a large hedge, and it’s a little harder to get a really even surface with one, too. Longer blades are heavier, and change the balance of the trimmer, making it harder to lift up. So if you are not too strong you will find a long blade more tiring, although the job will go more quickly. Long blades are more difficult to use to make rounded or curving shapes too, but terrific for that flat hedge look. A 13 to 16-inch blade is ideal for smaller shrubs, and small hedges, like boxwood. A 16 to 20-inch blade is perfect for an average, medium-sized hedge and is a good ‘all-round’ size too. A 20 to 40-inch blade is the choice for a big hedge or screen, or if you do a lot of trimming. How fast does the blade move? The ‘stroke rate’ is the speed at which the blade goes back and forth. High speed cutting gives you sharper, more precise trimming, but cut finer growth best. Speeds of up to 5,000 strokes per minute can be found. 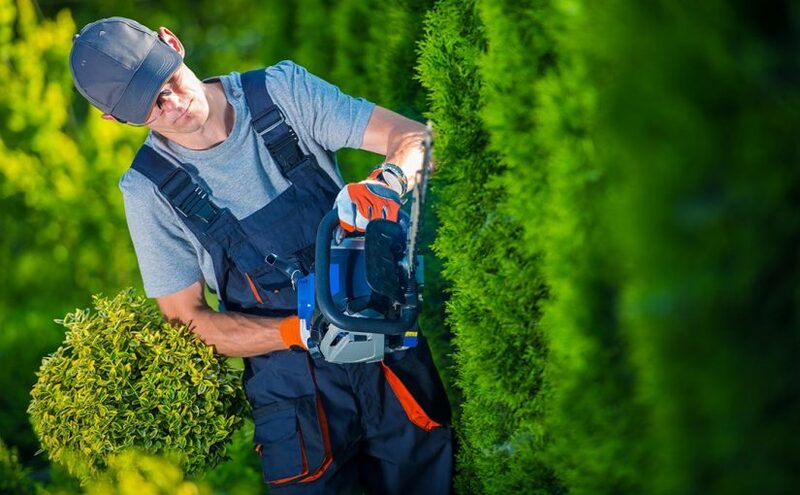 If you trim regularly, so you only cut fine growth, look for a high stroke rate and narrow teeth spacing – it will give you the smoothest hedge possible. What is the blade made of? Some blades are titanium coated. Others are made of high-carbon steel. Titanium is stronger and lighter, but not as hard, so it doesn’t stay sharp for so long. Most professionals choose high-carbon steel, as it sharpens well and holds the edge. However, carbon steel rusts, so you need to keep it clean and well-lubricated, especially over the winter period when it is being stored. This is a common feature, but it may be missing from cheaper models. If the front handle goes around three sides, you can turn the trimmer more effectively, making it easier to reach tricky spots. Some trimmers can be operated from a removable extension pole. This gives you more reach from the ground, and its quicker and safer to trim that way than from a ladder. If you need a range of garden tools, like a string trimmer, or small saw, then a hedge trimmer that is part of a kit range will save you money overall, even if the initial investment is higher. Anything sharp is a potential safety hazard, and hedge trimmers are no exception. To reduce the risk of injury there are several safety features available. You can decide which ones are most important to you and your own circumstances. If you have children, then a safety lock is important. Even if you keep your trimmer in a locked cupboard you might have to leave it out for a few minutes unguarded. Children love tools! Some trimmers have a lock that secures the machine in the ‘off’ position, so it can’t be accidently started. You have to simultaneously hold down the lock and activate the machine to start it. You might find this action a bit tricky, so if you don’t need this feature you might choose to avoid it, although most machines for the home market will have it. Some blades have blunt sections coming from the teeth, so you hit those before you hit the blade. This is a useful safety feature, but it can make the blade heavier and a bit more awkward to use. The biggest danger when working with a trimmer is operating it with one hand and then cutting the other one, or your free arm. So some trimmers have dual switches, one on the handle and one on the bar that runs across the top. That way you can only operate the machine when holding it with both hands. This does reduce your potential reach, so you might need a taller ladder to trim the top, for example. If you do a lot of trimming, being able to lock the blade on, rather than have to keep squeezing the handles, makes trimming easier. It does of course also make accidents more possible. In the garden it makes sense to establish a season routine, so that plant care happens at the times when it can have the most impact. Thuja Green Giant, grown as a hedge or screen, or as a specimen tree, is low-maintenance and easy-care, but some basic activities can make the difference between good and great. So let’s see what should be done for it at this time, as your garden is waking up, and new growth is everywhere. These things are especially helpful for new plants, perhaps ones put in last year, or planted over the winter. A good fertilizer program is the best way to get the maximum growth this plant is capable of. If you planted Thuja Green Giant, then you probably wanted something that would grow quickly, and create the hedge or screen you wanted, in the least possible time. You can help that out by using a suitable fertilizer for your situation. Young plants benefit from liquid fertilizers. These carry the nutrients already dissolved in water, so they are immediately available for the roots to take up. They are especially useful for the limited root volume of new plants, and their rapid availability means a quick response from the plants. These fertilizers are available either as concentrated liquids or as powders. Whichever you use, follow the directions carefully, as too much can make for big problems, with browning foliage and even death a possibility. Used correctly they are safe and efficient. Once mixed with water at the right concentration, water onto the roots, making sure you cover the whole root zone, which is a couple of feet or more in each direction. Liquid fertilizers can take a while to apply, especially on a long hedge, although hose-end applicators make it a lot easier and quicker. For more established hedges granular fertilizers, which are sprinkled onto the ground over the root zone, are much easier to use, and have the advantage of lasting much longer. While liquid fertilizers need re-applying every two weeks to a month, granular fertilizers need on only two or three applications a year. In fact, if you go for the modern slow-release forms, once a year, in spring, is all you need. These are more expensive, but the saving in time and remembering to re-apply is worth it. Fertilizer spikes are not so effective, as they do no give even coverage. They can be useful for a single plant, but overall their cost and reduced efficiency is hard to justify. Increasingly, gardeners are choosing organic sources for fertilizer, to avoid using harsh chemicals. There is a also a greater understanding of the need to activate natural processes in the soil, which improve it, and increase nutrient flows to your plants. This is often achieved by boosting the levels of soil microbes, adding those that can be missing, or specific forms to tackle the fertilizer sources being used. Whatever type of fertilizer method you use, make sure you choose something designed for evergreens. These always have a high first number in the formula printed on the box, something like 12-3-5. The exact numbers are not important, but the balance is. Look for a high first number, which is nitrogen, for green leaves, and ideally the last number – potash – will be a little more than the middle number, which is phosphorus. Potash makes plants more resistant to cold, heat and pests. In many places spring is a time of rain, and extra watering is the last thing you think off, but in some areas a dry spring is always possible, so be ready to water if the soil dries. Because this is such an important time for growth, where much of the year’s growth can happen in a few weeks, any dryness is going to stop that. If, in your area, you need to water your hedge very often, installing an irrigation line is a great time saver. The simplest and best is a leaky pipe, which weeps water from all over the surface. You need a pipe double the length of your hedge. Weave it in and out of the plants, laying it over the soil area, not right up against the trunks. Then use a regular hose to connect it to a tap. Let it run for several hours, so that the water soaks right in. An easy idea is to use a simple timer valve on the tap. This is then programmed for the length of time you need to run it, and you can also set it to run once or twice a week, if you don’t have substantial rainfall. If you have a built-in irrigation system you can connect it to that, as a zone. Always check the soil moisture directly, by touching it, or using a moisture meter. Even after a lot of rain it can be dry around a hedge, because the dense foliage prevents the rain penetrating. This is especially true with heavy but brief thunderstorms. A spring trim is always a good idea – for a hedge of any age. Start with an inspection and removing any dead stems or damaged branches. For new plantings it is important to trim lightly, even if the hedge hasn’t reached where you want it yet. This builds a dense structure, and it makes for a much better and longer-lived hedge. Just take the ends of the branches several times a year. You will hardly slow down the growth at all, but the result will be a terrific hedge. For established hedges, wait until the new growth has completely covered the hedge before trimming. When you trim, pay close attention to keeping the front of the hedge sloping inwards a little. Never trim so that the top is wider than the bottom. This basic principle will give you a terrific long-lived hedge that always looks great. For screening, trimming may not be necessary, but it still pays to go over the trees once a year, cutting back any branches that are outside the main structure, and even giving the whole screen a light trim. You may not want to reduce the size, but trimming will increase the density, and make for a more beautiful screen. Attention to these basics will give you perfect Thuja Green Giant plants – however you are growing them. It simple, doesn’t take a lot of time, and pays you back in beauty and utility. Green Giant or Emerald Green – What is the Difference? That screen or hedge you plant is an important part of your garden, and something that is going to be with you for many years. Making the right choices, planting it correctly, growing it up, and maintaining it, are all steps along the road to the perfect hedge – beautiful, functional and easy to care for. Hedge plants might all look green, but they are all different, and making the right choice is the first step on the road to that perfect planting. 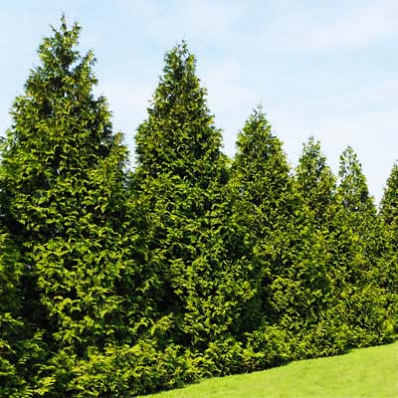 The top two evergreen trees for hedging are certainly Thuja Green Giant, and Emerald Green Arborvitae, so which should you choose? Let’s answer some of the basic questions often asked about these plants, to help you make the right choice for your particular situation. What is the Difference Between Green Giant and Emerald Green? Let’s start with how they are the same. Both these trees are evergreen conifers belonging to the group botanists call Thuja. They are part of the cypress family, and a small group, with just five members. All of them are trees of different sizes, and all have scaly green leaves that cling to fan-shaped small branches, creating a dense structure. Older trees develop small cones – which is why they are conifers. They are called cedars, arborvitae, or thujas – all these are the same trees. Of those 5 species, three are native to North America, and two to Asia. Their connection dates back to the time before the Pacific Ocean pushed those two continents apart. Emerald Green is a form of the Eastern White Cedar, Thuja occidentalis. This tree saved the lives of the early settlers, when native Americans showed them how to make a tea from the foliage that prevented the development of scurvy in the wintertime. Those grateful settlers called it the Tree of Life – which translated into Latin is ‘arbor vitae’ – the origin of that common name. Although an American tree, it was a Danish nurseryman who found the form he called ‘Smaragd’. That was in 1950, and the great virtue of this plant was that it stayed green all winter, instead of turning bronzy-green they way most of these plants do. That is why grateful American gardeners nicknamed it Emerald Green. The story of Green Giant is more complex, and also happened in Europe, at the same Danish nursery – D. T. Poulsen. In the 1930s they found a plant that they believed was a hybrid between a Japanese Thuja (Thuja standishii) and a Western Redcedar (Thuja plicata), they had growing near each other. These two plants grow on opposite sides of the Pacific Ocean, so they could only meet when brought together in a garden. Because of world events it was only in the 1960s that a specimen arrived in America, and only in the early 1990s that nurserymen noticed this plant and realize what a great hedging and screening plant it would make. It had never been named, but the name ‘Green Giant’ seemed very appropriate, so that is what it became. Which One Should I Grow? Interesting as all that is, the big question for most gardeners is, ‘Which one should I choose?’, so let’s try to answer that question. On this question there is no doubt. While Emerald Green is certainly a steady grower, adding as much as 12 inches a year once established, under good growing conditions, Green Giant puts that to shame. Like other plants that are hybrids, it is very vigorous, and can grow 3 feet a year when young. Over several years it will add several more feet to its height than Emerald Green will. So if it was simply a matter of growth-rate, Thuja Green Giant is undoubtedly the winner. In fact, there is nothing else that grows so fast, or creates a barrier so quickly. 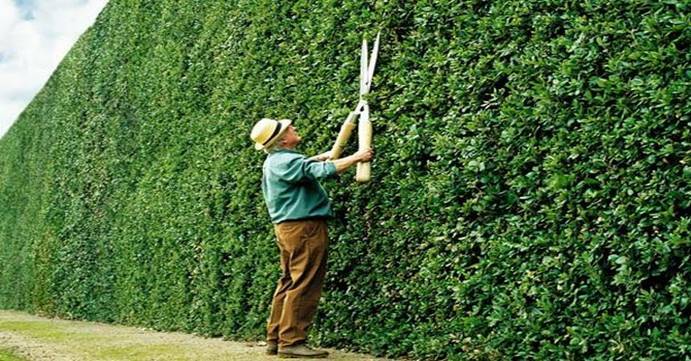 Size does matter – with hedges too. If you are looking for a tall screen or hedge, over 10 feet tall, then you should go with Thuja Green Giant. If left unclipped it will reach 30 in as many years, and it will be 12 feet wide if grown in the open. That is a big plant, so if you are planning not to clip, be sure you have the room for it, and allow enough space for its width too. No point in planning a ‘no trimming’ screen and then having to trim because it has grown all over your driveway! 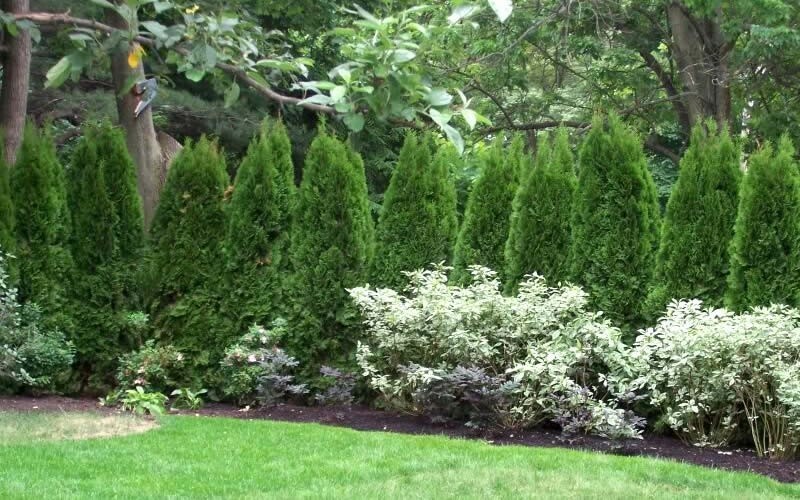 For smaller hedges, screens and specimen plants, choose Emerald Green Arborvitae, because it only grows 12 to 14 feet tall, and 3 or 4 feet wide. Where Do They Grow Best? If you live in the colder parts of the country – zones 2, 3, and 4, the Emerald Green Arborvitae is your obvious choice. It is completely hardy to minus 50 degrees Fahrenheit, without even needing winter protection. Green Giant might survive, with some injury, in zone 4, but beyond that it is ‘no contest’. Colder areas are just not suitable for that plant. Emerald Green will also grow well up to zone 7, so for smaller hedges in areas where you could grow Green Giant, you might decide that Emerald Green is your better choice. In the warmer zone 6, 7, 8 and even 9, then Green Giant Arborvitae is the obvious choice – and the only one in zones 8 and 9. It is impossible to be definitive about deer – when they are hungry enough they will eat just about anything. But Green Giant has been found to be deer resistant in many parts of the country, while Emerald Green is much more likely to be eaten. If deer are a problem where you live, the answer is obvious. What Kind of Soil Do They Like? Here too there are some clear differences. Both these plants do well in most kinds of soil, but Emerald Green, because it is a form of the eastern white cedar, will grow well even in wet, partly flooded areas, or any soil with poor drainage. If you have wet soil, and are zone 7 or lower, then Emerald Green is the better choice. If the soil is well-drained, then Green Giant Arborvitae will grow well, in anything from sandy soil to clay. Which Makes the Best Hedge? The answer here is simple – both. What matters in creating a smooth, flat-fronted hedge – which is what most people like to see – is spacing. Since Emerald Green is only about 4 feet wide when mature, in a single row you need to plant them just 2 or 3 feet apart, otherwise they will never grow together properly. With Green Giant, you can space them 3 to 5 feet apart, and still grow the perfect hedge. That difference means you need fewer plants, and the cost of a hedge will be lower. So there is the answer – it depends. . . Now you have plenty of information to make your decision – so you are much more likely to make the right one.